Nearly 1,000 people will witness the launch of what is being called the biggest tax reform since Independence. GST Launch 2017: The midnight launch will be held in the Central Hall of Parliament. 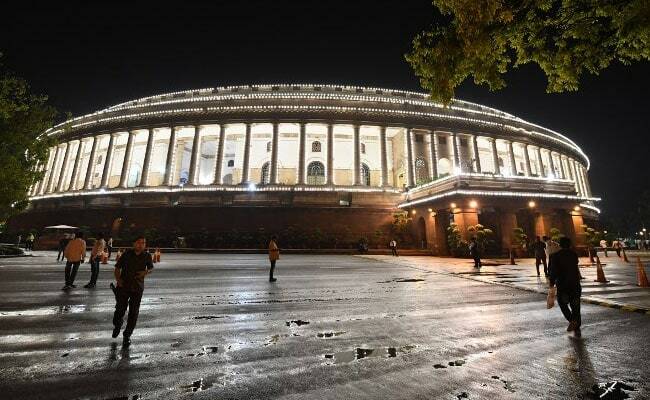 New Delhi: President Pranab Mukherjee, Prime Minister Narendra Modi and other dignitaries have arrived at the Parliament's Central Hall tonight for the launch of the Goods and Services Tax or GST. In just around an hour, the Prime Minister will launch the country's biggest tax reform at Parliament's historic Central Hall in the presence of President Mukherjee. The powerful GST council that has detailed the landmark reform met in Delhi just ahead of the midnight function and reduced the tax rate on fertilisers. It is the fourth time since Independence that an event will be held in the Central Hall at midnight. The last three celebrated India's Independence and that is among the reasons that the Congress has listed for boycotting the GST launch. Several other opposition parties too are staying away. Central Hall has been fitted with new carpets and sound systems for the big night. The event will start at 11 pm and will extend to just after midnight to usher in GST on July 1, the new date set after an April 1 deadline was missed. A gong will be sounded at 12 to signal GST is here. President Pranab Mukherjee and PM Modi will make speeches. At the high table of the Central Hall, former Prime Minister HD Deve Gowda will join them as will Lok Sabha Speaker Sumitra Mahajan and Vice President Hamid Ansari. Former PM Dr Manmohan Singh was invited too but the Congress' boycott means he will not be there. Nearly 1,000 people are expected. Industrialist Ratan Tata is be there, as will RBI governor Urjit Patel and former governors Bimal Jalan and YV Reddy. Mr Patel's predecessor Raghuram Rajan is not attending. The government has invited all Members of Parliament, Chief Ministers and state finance ministers. Opposition parties like the Congress, the Left, West Bengal Chief Minister Mamata Banerjee's Trinamool Congress, DMK and Lalu Yadav's RJD are boycotting the event. The Aam Aadmi Party too isn't attending the launch. Bihar Chief Minister Nitish Kumar of the Janata Dal (United) or JD(U) has backed GST and though he will not attend, his party lawmakers have not been asked to stay away. Senior JD(U) leaders Sharad Yadav and KC Tyagi will also skip the launch. Tamil Nadu's ruling party AIADMK, which had walked out when the GST Bill was passed in Parliament, said though they are not fully satisfied with provisions of the new tax, they "have no option but to support GST" and will attend today's launch. Union Minister Nitin Gadkari said, "Congress is a confused party where their Chief Ministers and finance ministers are supporting the GST and at the same time, the party leaders are criticising it." "A reform that holds great potential is being rushed through in a half-baked way with a self-promotional spectacle," Congress Vice President Rahul Gandhi tweeted. But like demonetisation, GST is being executed by an incompetent and insensitive government without planning, foresight and institutional readiness, he tweeted. The party has also objected to the plan for PM Modi to launch GST, saying President Pranab Mukherjee will be present and so should do the honours. Opposition parties also say that protests this week by textile traders show that small traders and others are not ready for GST. They suggested postponing the launch, with the Congress suggesting a two-month trial run before a launch on September 1. "No transition can be seamless but we will make it as seamless as possible. Let people be assured that there is no intention to harass if a genuine mistake is made...mistakes can be taken care of," Revenue Secretary Hasmukh Adhia told NDTV on Thursday.